Many parents share and nurture their child’s dream of becoming a musician. Kudos to parents who sign their kids up for music classes, take them to lessons, help them choose a good instrument and motivate them to practice every day. It can be tough balancing music with chores, schoolwork, family life and social activities, so for parents to support their kids’ ambition is a big deal. The guitar is one of the best instruments to get kids started on music and sharpen their cognitive skills. If your child has shown interest in learning to play guitar, here’s how you can help him or her do so. Guitars come in a variety of sizes so kids of any age would be sure to find one that they would find comfortable to play. In general, short-scale or 3/4 size guitars are recommended for children because these are smaller and would therefore be easier to hold. If the child is nearing his or her teen years, they can already give full-scale guitars a try. There is a wide variety of acoustic and electric guitars for kids that are built well, easy to play and offer good value for money. These starter guitars for children would do nicely until it’s time for the child to move up to a guitar that would meet their advanced needs or preference for a particular genre of music. Even if you have zero prior knowledge about guitars, you can easily learn the basics so you can be your child’s first teacher. This will ease the way to more formal music lessons in the future. Once your child knows the basics, he or she will become more confident when attending music lessons with a group or taking instructions from a guitar teacher. Children learning to play guitar need to understand the importance of practice, so make sure you help them set up a regular routine. Set aside 30 minutes to an hour every day for practice and give the child a quiet environment conducive to playing music. 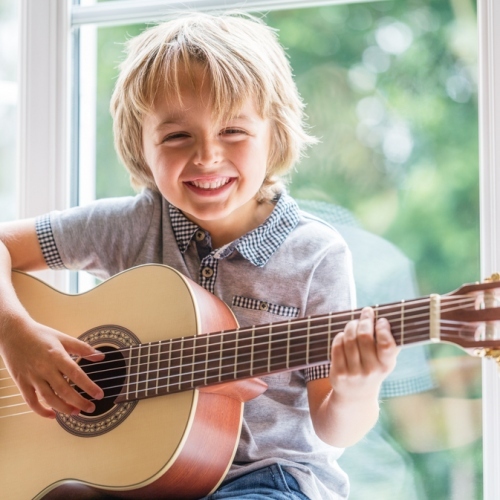 Ask your child when he or she would like to practice guitar – before or after school? Before or after dinner? Let it be the child’s decision and they would be more willing to take up their guitar to practice. One way to inspire kids to learn music and improve their guitar playing skills is to give music a constant presence at home. Listening to and talking about classical or instrumental guitar music, folk tunes and other forms of music lets children know that music is appreciated at home. You can also attend concerts, watch videos of guitarists performing or documentaries about musicians or bands to inspire and motivate your child to learn. Those are just some of the things you can do to help your child appreciate music, learn to play guitar and enjoy practicing. Support and encouragement are great motivating factors for children learning music, so we hope you keep these things in mind when helping your child become the best guitarist they can be.